What if they realise I’m a twitchy anxious person with a tendency to talk to much? Am I fast enough to dodge a group of bargain hungry sewists on the way to the remnants bin? If I feel like I’m talking too much I’ll break into some 80s hair rock. Nothing like a spoken word version of Guns ‘n’ Roses Paradise City to win friends and influence people. I’m used to dodging ladies on skates so I am so prepped for the remnants run. Remember Amanda- if in doubt feint left and run right. I have nothing epic enough in my wardrobe for such a lovely day out. 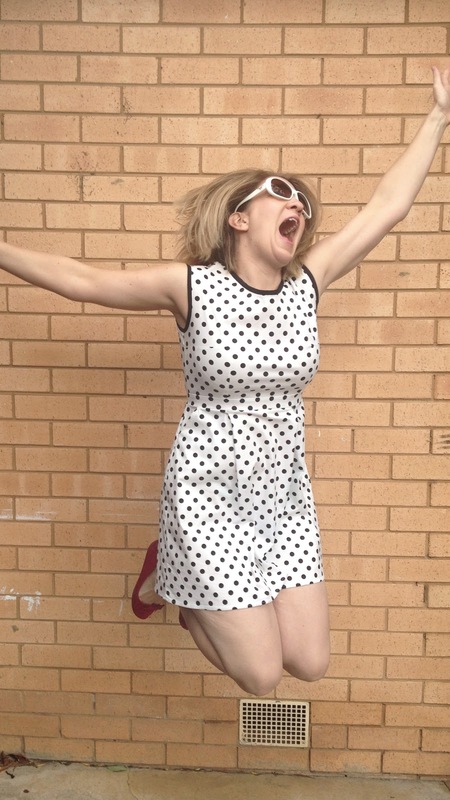 So enter the dragon… Or the epic pattern and cute fabric combo of the polka dot Belladone! Too rad! I must admit to sitting on this make for a couple of months now because upon finishing it I realised it looks pretty much identical to one that the always fabulous Anna from ::paunnet:: has made. Awkward unintentional style stalk, Amanda. 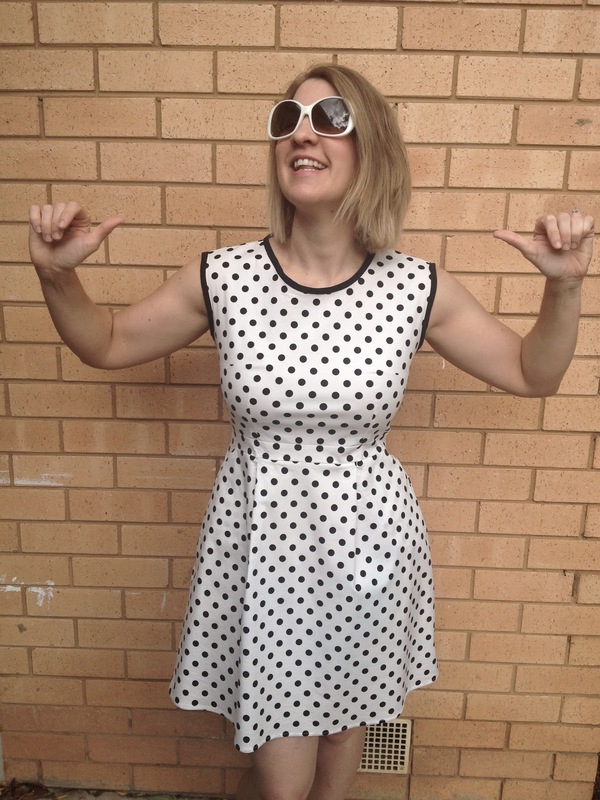 Oh wells, I’m chalking it up to ladies with impeccable style (and in my case a polka dot obsession). The world’s tiniest slash pockets. I can fit my phone, a tissue, a key card and a lip balm in there so that’s a win. But getting things out? If you’ve ever seen one of those youtubes of people trying to catch a greased pig that’s what it’s like trying to fish a key out of my pocket. Just with less grace and more oinking… Or is the other way around? Then, as I’m trying to neaten up the new seams on the inside, tragedy strikes in the form of folded fabric accidentally feeling the wrath of my serger blade. Oops. Luckily it was only the pocket, which I’m starting to feel a little sorry for by this stage, and with the help of some fray stop and shonky hand stitching it is repaired. But it did turn out marvellously. With thanks to the always lovely Oanh on twitter giving me some guidance from her English pattern I was able to get the bodice complete. Sure, I may have discovered at social sewing the extra three pieces of fabric I thought were spare (kind of like those extra screws in Ikea furniture) were actually a skirt facing but I still assembled the dress. And does the back look rad or what?! How quick this went together even though I kinda didn’t understand a lot of what was going on… Curse you lack of Babel fish! The back panel feature. 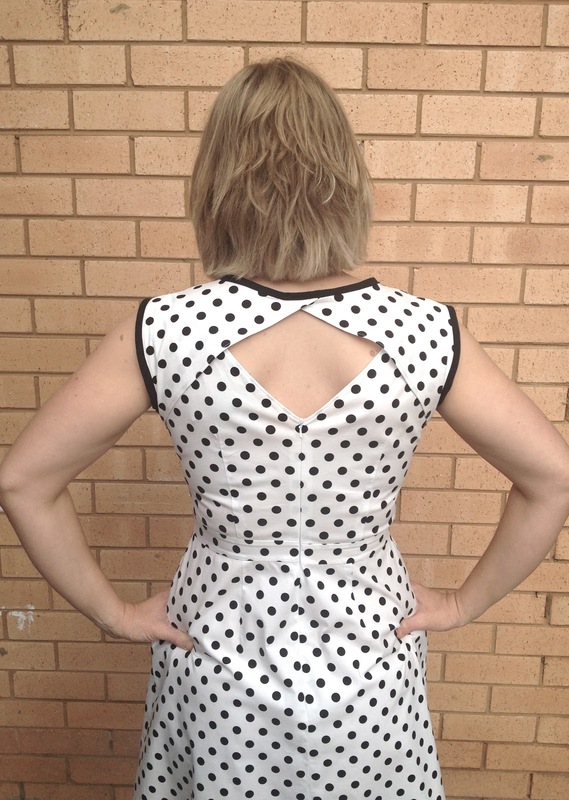 I remember seeing Belladone previewed somewhere on the magical interwebs before the patterns were fully launched and I was agog at the awesomeness of the back panel. I mean as sassy bit of back meat on show but also enough coverage for your bra straps? Total win! Could it be any cheekier?! Fit the pattern properly. I was rushed to get this done and took some short cuts but I want to be able to easily fit my hands into my pockets. Yup, I’m all fancy with my airs and graces and pocket usage. Bias bind all the edges of the back panel. It’s looks great already but I think I can set the sass-o-metre to 11 with some more bias binding. Add an extra inch to the skirt length. I’m really conscious of the skirt being just a smidge too short as it is difficult to pick things up off the floor without flashing sum ov me bloomers (I really hope there was a bad cockney accent in your head just then). Overall, I am obsessed with this pattern. I’m talking I could have five versions of this dress and be happy to wear one each day. In fact, I may have the most perfect coral pink polka dot fabric ever to make another with… Who has a problem with polka dot dresses? This gal! YOU LOOK AMAZEBALLS!!!! You have sold me on this pattern. You look classy and hot and I can’t get over the polkadots. love love love it! C’est fantastique! Super cute, as always! Merci, lovely lady! 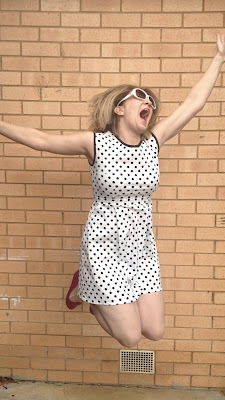 Any frock I can rock with cons make my heart sing! That’s all I’m saying. Oh, and that “back meat” should only be reserved for sheep and piggies. Yey for your great dress. 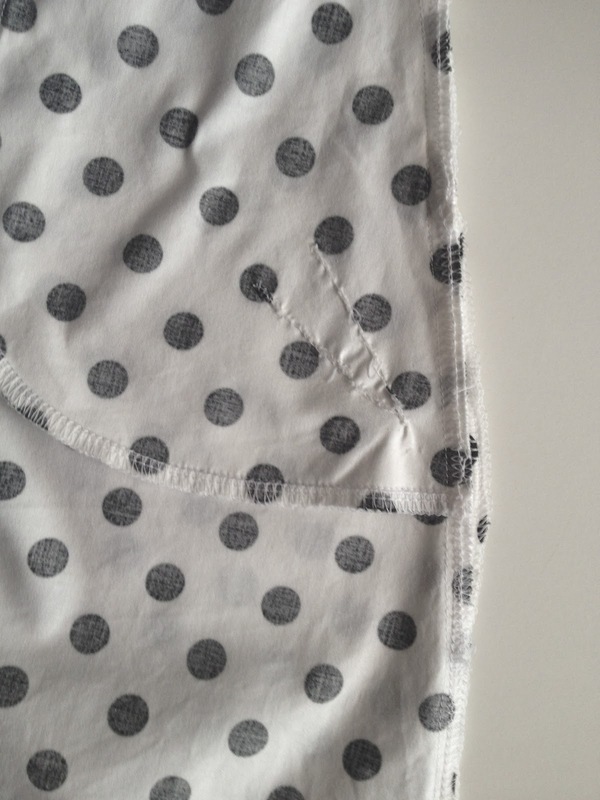 A pair of polka dot Amerson undies must surely be the answer to the length problem? Non? I have recently brought the belladone too, planning to make it in the most expensive material I have ever owned aka liberty so obviously I am too scared to start! Also, your slash pockets sound like Mary Poppins’ carpet bag. Who needs easy balm retrieval when your clothes are magic? Very cute! I have a major love of polka dots, so this one is a win right off the bat. But when I saw the back, WOW! So awesome! What a great dress! And the back is aaawesome!!! Amanda, the fact that you used fray stop is a win in my books. Hardly a garment gets made without my little tube coming out. I love this. It looks ace!!! Hope you had a great time at your meet up. Win win win! Eeeeeep. I love this dress! The silhouette is perfect and very flattering. Don’t ask me how many garments I have with tiny slash pockets due to last-minute side seam serging. Or maybe I just have giant bear hands, dunno. But your dress is super cute. I’ll take your adorable and treasure it like a delicious cupcake. Yippee! When you phrase it like that- really, who needs full sized pockets anyway? Isn’t it all kinds of rad? That back panel makes me swoon! I’m converting to the ways of fray stop- so many uses. How have I gotten by without this magical goo? I love this pattern! I didn’t know they were out in English now. I so need this. Your version looks amazing. And on the point of freaking out about meeting sewing peeps I totally hear ya. I’m already having anxiety about what to wear to frocktails! You already know I love it, but it deserves to be said again: it’s gorgeous!!! You are too cute 🙂 Looks great. ps. Totally had the accent. Ok, you have convinced me, I will buy this pattern! It is gorgeous!! Great dress! 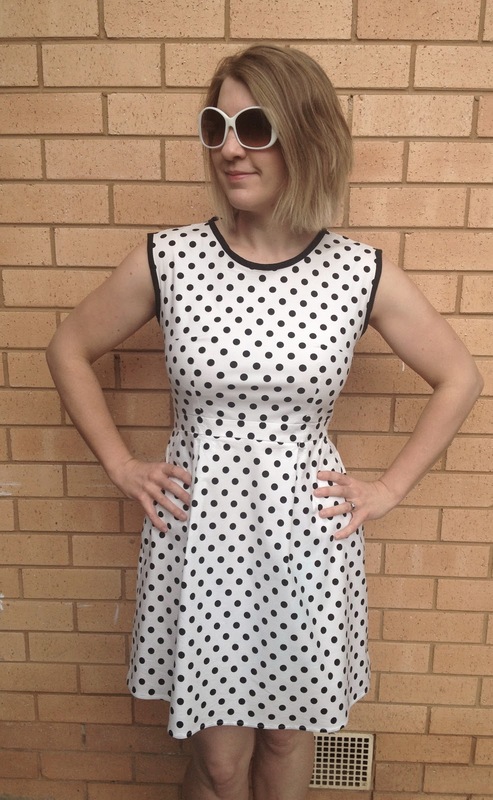 Can’t beat polka dots. I did the same thing with slash pockets on my crescent skirt and ended up with 2 pockets at different sizes of small! Thanks, Jenny! you should give in to Belladone. It’s a super pattern! Kat, you need to get on this pattern! Eleanore has mentioned the new patterns are out Monday. SQUEEE!!!! BWAH HA HA! Accent win! This has made my day! Awesomeness! You won;t regret it at all, Liz! Hahaha, I just got this pattern and I have a polka dot fabric set aside for it. I must have even subconsciously inspired by Paunnet’s version also. This is so awesome!! I love how nice and neat everything looks. Especially your cut-out! I’m working on this dress right now! I want hundreds of versions of the pattern! Yours looks spectacular– nicely done! Also, I have the English text of this pattern as a PDF as I proofread it for Eleanore– want me to email it to you? This is so perfect for your figure- totally perfect- you look amazing! I love that back cutout! Way to persevere without the Babel fish in your ear…it was totally worth it. And yes, I have the same worries about meeting up with other sewists! Thanks, Leila! 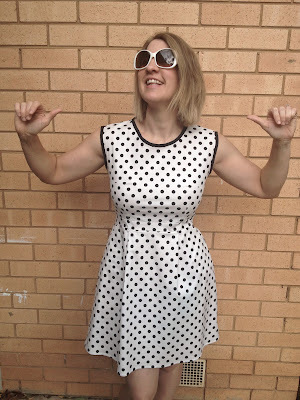 Polka dots for all! I love me some exclamation points!!! Sergers can be super rad or all kinds of scary. Noone deserves serger problems! Thanks, lovely! I am super happy with the back finish- it was a bit scary for a while there! I honestly think Babel Fish should be sold somewhere local 😀 The meetup was super awesome though I must admit to being all kinds of nervous to start! Hmm, so if you break out the Guns and Roses lyrics I’ll ask you if there’s anything I can do to help you feel more comfortable, when we meet? And I’ll know what to do if I’m feeling awkward. I might have to do bon-jovi lyrics. Or maybe I could remember a few G+R lyrics… It’s been a while. Hey I’m falling in love with that back. Heck, in love with the entire pattern. And totes agree about more bias on it. Thanks, lovely lady! I was stealth sewing this sucker like a boss! I may have carried it on to the plane because I didn’t want the frock to crease in my bag. I live on the edge! And the extra hem facing pieces *snicker* It was so lovely to see yours! Woo hoo! I did not know I could comment on your blog with my Twitter account. Totally going to troll your comment stream now. Thanks, Dixie! Sergers are our greatest friends… but our worst enemies. Craziness! Merci! Team Belladone is owning it! This looks frickin’ hot on you! !